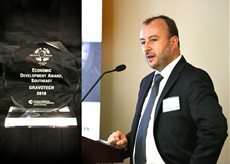 Our Senior Director, Frederic Lallemand had the pleasure of accepting the award for Economic Development at this year’s Crystal Peach Awards Ceremony. We would like to thank the French American Chamber of Commerce for this honor. Since 1938, Gravotech brands have been global leaders in the design, manufacturing, sales and support of innovative solutions for engraving, marking and artistic modeling. We are happy to receive such an award for our years of service and growth to the community.